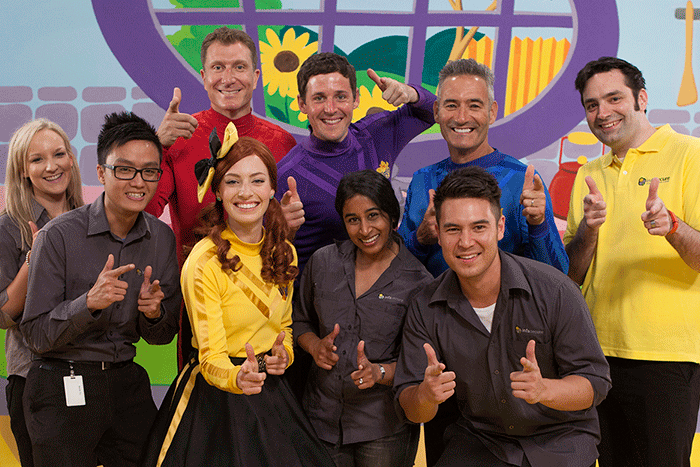 Breaking News: InfaSecure teams up with The Wiggles! Leading child restraint manufacturer InfaSecure has announced a 3 year major strategic partnership with the unstoppable #1 young family brand, The Wiggles! This is a major step toward their objective of increasing car safety education and best practices and what better way than to partner with the fun and colourful Wiggles family. A key aspect of the relationship will be the integration of child restraint safety educational messages into The Wiggles’ entertaining and engaging content for parents and children. Do you remember how much easier our parents had it when they could call on Fat Cat to help get us little ones to bed? There was no not much argument when Fat Cat came on telly to say goodnight – we just said goodnight too. Well imagine having The Wiggles on your side when you’re struggling to get your toddler to keep those car-seat harness straps on. You know what I’m talking about, right? Or picture having The Wiggles ‘in the car’ with you when you’re convincing your spirited little one that they HAVE to GET IN the car-seat before you can leave. What a clever, clever strategy. Well played InfaSecure. Well played. 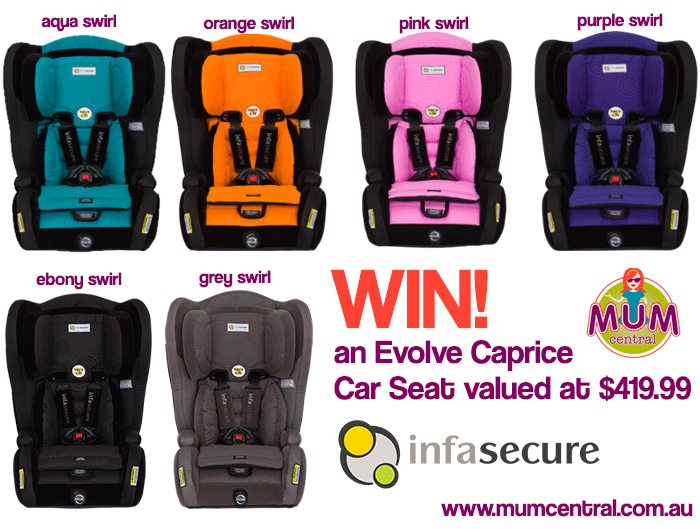 Which is why, thanks to our friends at InfaSecure, we are celebrating this fabulous collaboration by GIVING AWAY an Infa Evolve Caprice Car Seat valued at $419.99! Here’s some of the things we love best about the Evolve Caprice. What about you? It’s the first child restraint in Australia that allows the use of a six-point harness from around 6 months of age through to a large 8 year-old. Now there’s value! The cleverly designed Twist & Lift™ system allows one-handed adjustment of the headrest and harness from the front of the seat. No rethreading straps, no uninstalling – you can get the perfect fit in seconds, and it’s never been easier. The new twist-resistant straps make your day to day use a little less frustrating. The Evolve features a Dual Layer A.C.T. headrest, and reduces crash energy to the child more than five times lower than the level required by the 2013 Australian Standard. No add-ons, no upgrades and no extra cost. Available in 6 popular Caprice Swirl designs, aqua, orange, pink, purple, ebony and grey! Each seat features plush comfort padding for smaller children, which can be easily removed as needed. They’ve designed the Evolve’s cover to be completely removable without taking the restraint out of the vehicle, making cleaning easier than ever. Hallelujah to grotty back seat adventures! The Gradual Recline system is extremely easy to use, allowing unrestricted recline positions which can be changed without removing the restraint from the vehicle. Convenient pop-out cup holders so your children are always comfortable, regardless of age. Milk anyone? So what are you waiting for? Get Wiggling! I would love an orange swirl one. I think my favorite feature of this car seat is the height adjustment without have to take the seat out of the car, whether when your child is growing or like me are using the car seat for multiple grandchildren of different ages, this is a great feature. Oh I LOVE that it offers extended use of the six point harness. I am not a confident driver, and that extra Infa-security would bring great peace of mind. The colours are amazing, but given that my children seem to be made of 80 percent dirt …. I would have to opt for the Grey Swirl! The completely removal cover is a god send! The most annoying thing about a car seat is when you cant take the cover off to clean… not much fun putting your hand down the side to find a dummy and find food instead! Ebony swirl or grey swirl would suit our car interior best. I love the one handed adjustments of the straps and headrest. Sounds practical and easy!! Our favourite wiggle is Lachie so it has to be Purple!!! I love that it will last until 8!!! and all the special little features to make my life easier, an who can argue with such fabulous colour choices! I would definitely choose pink swirl!! I love the many features of this car seat from it’s comfort, ease of use, style and versatility but number #1 for me is always safety! It seems as though safety has been a huge consideration in the design with the dual layer headrest! This car seat looks absolutely amazing and I can’t wait to see the Crep results once it has been tested! My son’s favourite colour is orange, so we’d choose the orange swirl. I love that the 6 point harness goes up to age 8. You don’t get that on other car seats! I would choose the orange swirl as it is my sons favourite colour and the features i love the best are the twist-resistant straps, the pop-out cup holders and the adjustable height harness buckle. Twist resistant straps sound amazing! The fact that it will last until 8 years of age is also very tempting! I’d have to go with the purple swirl as there’s no rainbow. And twist resistant straps? Hell’s yes! this seat has so many amazing features! I love the tilt & lift, what a fantastic idea and the fact that it will last right through until 8 years of age is great, a worthwhile investment!! The pop-out cup holders! Although I fancied myself as a bit of a MacGyver (using a shoe as a holder), this is way better!! I would choose Ebony Swirl and love the fact that it has twist resistant straps making it easy for new mums to be. The Twist & Lift system combined with the Dual Layer headrest means my child will be as safe as possible in this seat and the removable cover will keep the Grey Swirl looking new for the whole 8 years! The aqua swirl is gorgeous! I love the cup holders and thatcher seat covers are easily removable so that it’s not a trigger to keep them clean. I love the aqua colour but all of them I would have! I love that your child is able to stay in the 6 point harness until 8. I am upset that my 5 year old twins have hit the height markers in there current seats to no longer have the harness. I like the Ebony Swirl, neutral but still nice! I’d pick the grey swirl – I love how simple it sounds to make adjustments whilst your child is sitting in the seat! Aqua Swirl – Being able to completely remove the cover without taking the restraint out of the vehicle will save time when cleaning up the delightful mess my toddler leaves behind. I think that the aqua swirl would be the top pick from my house. And as a mum, the twist-resistant straps would be so helpful on those rushed mornings. I would be happy with any colour from the Evolve Caprice range of car seats, although I do not mind the ‘Grey Swirl’ for its neutrality, whilst still allowing the user to view the straps and buckles. I love the fact you can remove the cover for washing without having to remove the entire restraint. This is a great timesaver. Plus, the Twist & Lift system, is an added bonus. Need I say more! it’s suitable for girls or boys. Love the grey swirl & also think the adjustable height harness is a fantastic feature-perfect for me who often look after my grandkids of varying ages & adjusting the straps can be so tricky! We’d love the grey swirl. Our fav feature is that it’s from 6months right up to 8yrs of age so this will do all 3 of our boys! It’s twisted again, how on Earth does it do that! OH MY GOD, what was that – my hand landed in goo! wrangle the straps & the cover off – when I figure out how that’s done! Oh, how much easier an Ebony Infa Evolve Caprice would have been!! The orange swirl would be fantastic for my gorgeous little grandson he needs a new seat all of his own. Also the safety features are so much better than the basic seat he is in. I would love it in Purple Swirl and I am in love with the twist resistant straps. I have the worst time trying to untwist straps to get my little ones in safely. One-handed adjustment of the headrest and harness is a must when you are a Mum we have our hands full! I love the Aqua Swirl suits a Boy or a Girl. Definitely the twist resistant straps, it’s annoying when they are all twisted! The pink one is cute. It’s a combination of things, all relating to not having to uninstall to change the fit/settings. Brilliant! Twist & Lift system sounds very handy for me. Love purple one. Not having to uninstall to change the fit/settings is wonderful, the Twist and Lift system. Really like the purple colour. I would love the grey swirl, I would dearly love to have a go at the twist resistant straps, on our current seat I am forever untwisting. It would definitely be a time saver for me! Orange is very tasty colour. ‘It’s the first child restraint in Australia that allows the use of a six-point harness from around 6months of age through to a large 8 year-old’. It’s my favourite feature. That would save me money. I would love a pink one for my little miss nearly 3. She’s very envious of her brother’s blue evolve! Apart from the obvious safety factor being able to harness to 8 (and possibly beyond!) I love that you can install in such a way that you don’t have to uninstall the seat in order to clean the covers! Makes it much easier to keep nice and clean! Orange ! Bright and happy like my little Ethan ! My Fav feature ? The easy to remove cover. I can’t remember the last time I’ve washed the car seat cover on my current baby seat . I’m to scared to see what’s smudged into the fabrics and can’t cope with the inconvenience of taking the whole seat apart ! This seat would be a perfect gift for my toddler as he has to give up his current seat for a little brother arriving soon ! I love the purple swirl. What a great idea that it has 6 different harness points, so it can be used right through until the child is eight. Gorgeous colours but would have to choose the ebony swirl. Yes finally a seat that has twist-resistant straps. This would have to be my favourite feature. Twisted straps frustrate me so much! I know, those twist resistant straps are a godsend aren’t they! Safety, easy clean and easy installation! ebony swirl, the removal covers are great as they will need to be cleaned , often. I love that I can keep my child safer by having them properly harnessed until they are 8. I would love absolutely love to have twist resistant straps…wouldn’t we all. Pink swirl for my baby girl, best feature is it’s the one seat from now (9 months) to 8 years! I’d choose purple swirl. It’s one of my daughters favorite colours, but it’s also not overly girly, so her little brother can use it once she outgrows it. I want my children to be as safe as possible in the car, so my favorite feature is definitively the ability to harness for such a long time. Grey would go with our car. The twist resistant straps sound amazing as I’m always fighting with the straps in our current seat! Plus the easy removable cover to make washing a breeze! We would love a pink evolve caprice for one of our 4 girls. My fav feature is obviously the 51cm harnessing, that is an absolute winner in my eyes. Purple swirl would be awesome. Love that it lasts from 6months to 8 years. Purple swirl is my favourite.The best feature is the non twist straps! I love the purple swirl. I would love to win this for my 8 yr old so I can put her back in a harnessed seat. She is small for her age and would get another 2-4yrs out of this seat. I’m so sick of telling her to make sure the sash is back in the sash guide in her booster seat as it slips out as she moves about. Her brother (my 4.5yr old) can use it after her as he is still small for his age too. My favourite feature on this seat is its can harness up to a large 8yr old or small 10yr old. I would love ebony swirl and my favourite feature is the twist-resistant straps as this drives me insane, always having to retwist every time my bubs is in the car seat! Love how many features there are that don’t require removing entire seat. I love the easy to remove cover which makes keeping it clean a breeze. I love the Aqua Swirl colou rand the fact that the twist resistant straps won’t send me batty when they get twisted! Aqua Swirl. The fact that you can remove and clean without needing to reinstall is genius. Grey swirl. It matches my upholstery! Sorry – forgot to mention why! I love the seat’s safety; in the end that’s all that matters. Purple swirl. The twist resistant straps totally had me! How many times have I had to stand there fixing the straps because they were all twisted and at times, too tight and needed to be untwisted before they could be buckled in comfortably! The orange swirl and twist resistant straps is my favourite feature. Why is it whenever there is the added pressure of someone wanting my parking space the twists in the straps refuse to straighten? Grey swirl – practical. The twist resistant straps are a godsend especially when ‘little and ‘big’ people play with the straps and also ease of cleaning – so love not to have to remove and reinstall the seat all the time. Purple swirl. My little the girl would love it!! And I’d love her to be nice and safe in this seat. Ebony swirl. Best idea is the removable cover, that would make cleaning a breeze compared to having to remove the seat & straps etc in our current seat. Pink.. My princess would feel special sitting on it. the height adjustment and the comfort padding would be a bonus. And peace of mine for me that my daughter is safe and secure. Purple Swirl! I like that it can be used from 6 months to 8 years. Very cost effective. My daughter’s favourite Wiggle is Lachy so it’s Purple Swirl for us! I love that you can make all the adjustments and remove the cover without removing the seat. Ebony swirl, harnessed up to 8 years brilliant!! Aqua Swirl and loving the popoff covers for washing my mucky messes away! I love the purple or the aqua seat, and I love the fact that these have a 6 point harness up to 8 years of age. The cup holders are a thoughtful bonus!!! Pink is the favourite, one-handed adjustment of the headrest and harness from the front of the seat is a great feature. I like the twist-resistant straps and orange swirl is my favourite colour. Probably the light grey for practicality, but the other colours are great too! Love the Aqua swirl. Top safety features and no ongoing expenses until your child reaches 8 years of age. Evolve into the new generation and be reassured that you have only the best. Definitely purple swirl to match my youngest daughter’s Kompressor. Love the Twist & Lift, so easy to get the perfect fit in just seconds. I would love a pink or purple swirl for our little miss. Pink swirl. My favourite part of this chair would have to be the versatility of how it transforms as my daughter grows- up to 8 years old is pretty impressive. Purple swirl. 6 point harnes. Aqua Swirl. I love that we can keep Miss 4 in a 6-point harness as long as possible, especially since she has a long torso and would outgrow the harness of a convertible booster at quite a young age. We love the Evolve so much we bought two soon after they were released, but we’d love to win one for my mother-in-law to use for all her young grandkids. I would love the Purple Swirl, There are just too many reasons why i love this car seat but most of all it has everything we need for safety, as Safety always comes first. Extended harnessing children and the purple swirl is my favourite colour. Any colour would be good, My daughter has 5 children, ages 5, 3,2,1 and a newborn baby 2 weeks old. When travelling in the car safety is very important and this car seat has all the safety features parents are looking for. A new car sseat is very much needed and would get excellent use. I would love the aqua swirl. I love that they can stay in a 6 point harness for longer and the twist-resistant straps sound AMAZING! As does the twist and lift system! Actually everything about it looks amazing! Orange Swirl is super cool. Safety is always number one on my list, followed by comfort and ease of use. I believe this seat has all these things! Ebony swirl. The feature that appeals to me most is the ability to keep my son harnessed for the duration of his carseat years and beyond, safety is incredibly important to my husband and I.
Purple Swirl (my fav colour) I love the ‘Pop-out Cup Holders’ what an awesome idea especially when travelling as my kids always spill their drinks as they don’t have a place for them. Purple swirl. Safety, ease of use, versatility and comfort. We’ve tested this seat at the shop and my kids loved it! Ebony Swirl as my boy likes it best 😀 We would like our son in a 6 point harness car seat for as long as possible so the Evolve’s feature we love best is built-in harness till 8 years old approx. :) another unique feature we love lots is the Dual Layer A.C.T. headrest reducing crash energy to the child’s head. We would definitely love the pink swirl as we tested one of these in the shop and fell in love with how safe they are. Our daughter had a liver transplant 2 years ago and we are fanatical about her safety. It would mean not worrying about her in the car. Aqua swirl! I love the fact it fits kids safely for such a long period of time, and keeps them harnessed! Ebony Swirl please. I love the adjustable height harness buckle meaning its easy to adjust without moving the seat. And all of the safety features. Aqua Swirl – and definitely the twist-resistant straps! Always so frustrating when the straps get twisted. Ebony Swirl. The adaptability in that your chair allows for your child’s growth, together with the ease of use with the Twist & Lift feature, the main thing is the headrest that absorbs crash energy; so many clumsy drivers out there, this seat means SUCH peace of mind! I love the Aqua Swirl colour. I love the twist resistant straps- they’re an endless source of frustration for me in car seats! Grey Swirl for my little lad or aqua swirl if you are running out of grey, just want him to be safe! Love the aqua swirl and the best feature for me is the one-handed adjustment of the headrest and harness from the front of the seat! Purple swirl please. The twist and lift system sounds super easy. Aqua Swirl and love the twist & lift system. My little girl would love the purple swirl colour and I absolutely love the fact that you can adjust these car seats with only one hand and with ease too! Absolutely genius for busy mums and dad’s with their hands full! sounds fantastic! Grey Swirl, there are so many excellent features it is too hard to pick just one as a favorite. Ebony Swirl. Comfort, safety, suitability from 6 months all the way to 8 years of age. I’d love Grey Swirl as it’s the same colour as our cars interior :p ….my favourite feature is the Twist Resistant Straps, because let me tell you, the straps can make or break a carseat, I hate fighting with my eldest (2 year old) to strap him in lol. My 2nd boy is almost ready to go into a big boy seat: it’d be amazing to trial this super safe carseat with Dan, before having baby number 3! Orange Swirl, I love that it if from 6months to 8 years we are currently looking a buying new car seat for my son. The adjustable height harness is also a great feature as well as the twist resistant straps. Ebony swirl. I love that you can adjust the harness without having to pull the car seat out of the car. I have three seats across the back of my car and getting them out is a mammoth effort so anything that saves time is a huge tick in my book. I also like that it will last to fit a large 8 year old. This is the other thing that I dread, buying a seat that will last so that I don’t have to re-buy x3 when the kids grow out of them!! Designed to last 7 & 1/2 years will put a smile on the dial of parents from a savings and safety perspective. Aqua is cool for both genders. Love the brightness of the orange swirl! Attractive for little ones while being super safe. Orange swirl . I love that it is the only child restraint, with the safety of 6 point harness, that I will ever need to buy. Very economical as it covers the ages of 6 months to 8 years. We would love the Aqua Swirl. My fav feature in the evolve is the ability to have a 6 point harness for a child up to 8 years. I believe that if they have to be in a car seat till that age then it should be proper harnesses and not just a booster seat. Found It Day 5. Ebony Swirl. Safety is paramount for me so my favourite feature is the Dual Layer A.C.T. headrest, and how it reduces crash energy to the child more than five times lower than the level required by the 2013 Australian Standard. Found It Day 5, I love orange colour because it is warning colour in psychology and matching my car seats. Purple swirl, i love that i can use it 6 months to 8 years. That what i call “value for money”! Found it day 5 ebony swirl, love that it is convertible! Found It Day 5. I love the Aqua Swirl. I love its deep side & head wings! My child would think he was a racing car driver and I’d have no problem getting him to sit in it! Found it day 5 !!! Found it Day 5- Aqua Swirl and the adjustable height harness buckle is an awesome feature! aqua swirl – the fact that it will cope with a large eight year old – we’re over changing car seats all the time! Found It Day 5, Infasecure has several features which I love, multiple colour , six points harness, dual layer A.C.T.headrest and pop-up cup holders. It’s a very smart car seat, family friendly suitable for every car. Found it, day 5 – ebony swirl, cup holder – brilliant idea. Found it day 5. Love the aqua swirl! Purple swirl love the harness, so much easier than trying to find the seat belt plug in the dark! Found it day 5, yay! I would take ‘grey swirl’ because it is a neutral colour and it does not get stained as easily as the brighter colours do. Found it Day 5 – loving the Aqua swirl, good for both my kids (boy and girl). Found it Day 5 – I would choose the ebony swirl, would be lovely with the dark seats in our car. Twist free straps = AMAZING! Found found it day 5. Found It Day 5. Aqua Swirl would be a perfect match with our dark car seats. Loving the twist free straps nothing worse then having to untangle the annoying things before going anywhere. Aqua Swirl is my favourite colour, and the twist resistant straps would have to be my favourite feature, with 3 little kids I’m constantly trying to un-twist straps every time we hop in the car! Found It Day 5. The Aqua Swirl is my favourite colour and I love that the straps are twist resistant, as I always seem to have that problem with car seats! Found It Day 5, Love the Aqua Swirl, the twist resistant straps would make life so much easier to get the children in and out quickly. Found It Day 5. I would love ‘pink swirl’ for my girl (after two boys of course it has to be pink!). My favourite feature is that the cover can be removed for cleaning without having to take the restraint out of the car – with three kids this is a pain anytime the seats have to be taken out and put back in! Found It Day 1, Purple Swirl. My favourite feature is being able to take the cover off without removing the entire seat. Found It Day 5, Purple Swirl. My favourite feature is being able to take the cover off without removing the entire seat. Found it Day 5 Purple Swirl and the large age range. The security feature of InfaSecure car seats, specifically this Evolve Caprice, doesn’t compromise comfort and versatility and style. We only want what’s best for bub and we trust InfaSecure from Day 1. Found it day 5 I would love a pink swirl evolve for my daughter as she’s so little and I love how the evolve will allow me to harness her as long as possible ! The bright funky colours will also make it easier to keep my daughter wanting to be harnessed. Found It Day 5 – Purple Swirl, and I love that it uses a 6-point harness to age 8! Found it day 5. Purple swirl. Twist-resistant straps are an excellent idea. Saves so much time and less struggle. Found it Day 5: Purple swirl and the pop out cup holder is a great feature. The easy clean feature, although there are so many good features to choose from. The height adjustable harness. I love being able to adjust the height with out removing the seat. Found it Day 5. Love the purple swirl. Twist resistant straps are a great idea. Found it day 5. I love the fact that it’s capable of holding a child all the way from 6 months through to 8 years old. Much cheaper than having to buy multiple seats over the years. Found it day 5. Love that it will last bub from 6months of age up to 8 years! I would love an Aqua Swirl to brighten up the back seat and my favourite feature would have to be the fact you can completely remove the cover without taking the restraint out of the vehicle….sure to save some precious time! I’d love the ebony swirl seat. I love that you can do so many things to this seat without removing it from the car but particularly changing the height of the harness. This would make it so much easier when ferrying around the kids’ friends and cousins. Purple as it’s a favourite of both girls and boys – So purple swirl is our pick! We know that those Wiggles who wear purple are relaxed peeps, wake up Jeff and Lachy! – Relaxed children, yes please! I love that the Infa Evolve car seat safely seats children from age 6 months to 8 years. We’ll only ever need the one car seat, Let’s wiggle to that! I just love the idea of a lazy seat (no uninstalling to adjust) and I won’t have to buy another – this one will do the job until they can sit in a seat without a booster. What’s not to love about that! Pink Swirl! My girls would just love having a pink car seat. I love that the cover of the seat can be removed without having to take the whole car seat out of the car. It’s always the part I hate most when I have to clean my girls seats, as my 4 year olds seat in particular is not exactly light! aqua swirl. Twist & lift! I love the Aqua swirl, the pop of colour is a nice change from the ordinary! I’m definitely in favour of the removable seat cover for easy cleaning, kids and mess are synonymous. Aqua – Dual Layer A.C.T. headrest, anything that can reduce the chance of injury is most welcome. AQUA SWIRL is my colour choice and since my youngest is a little HOUDINI, I’m loving the 6 point harness!! Purple swirl – twist resistant straps, drives me insane constantly straightening them up. Ebony Swirl. That the cover to be completely removable without taking the restraint out of the vehicle, making cleaning easier than ever. Purple Swirl please. I love the idea of pop out drink holders. Finally somewhere to hold the water bottle. Grey Swirl – I can’t choose between the the fact that it covers a child from 6 months old through to 8 years old or that it has an adjustable height harness buckle, where you don’t have to remove the car seat from the car to change it. Both great factors. I’m going with the Pink Swirl. then Aqua then Purple….wow, it’s so hard to decide! Best feature by far would be the removable cover without removing the seat. Great invention, and I’m guessing it was done by a very frustrated parent! Ebony swirl, the best feature is definitely the fact that it suits up to a large 8 year old as I have a small 7 year old son that still developmentally requires a supportive seat with a harness. Purple Swirl. I like how the seat grows with the child and is all fitted with the 6-point harness from 6months to 8 years. Its great that you will only need the one seat for the child instead of the pile that seem to accumulate in the garage. Aqua Swirl. Safely of course is No. 1. It’s a one stop car seat shop. Love that. So little is built to last these days. The Gradual Recline system would be my favourite feature. Very handy! One hand harness adjusting! Means it can be changed easily for a different child. Purple. The easy to remove cover is a great idea. I love the orange swirl. I love that you only need 1 seat instead of potentially 3 over 8 years! Also the fact that the covers can come off easily for washing is awesome as well. AQUA SWIRL – Love it’s long life, that it can be used from 6months of age through to 8 years old. Fantastic value indeed and hassle free, no need to replace as child grows. I love the orange colour. I also love that you can use this seat from 6 months to 8 years!! Brilliant!! I would love to win the Aqua swirl seat! I’m happy to be buckled up. I’m buckled up! Oh yeah, I’m buckled up. I’m still buckled up! Oh yeah, I’m buckled up. I can buckle up. Oh yeah, I can buckle up. It’s safe and sound. Man, I’m buckled up. It’s a long way but I’ll be OK.
I’m buckled up. Beep! Beep! I’m buckled up! Feeling safe and sound. Man, I’m buckled up. Oh how I wish there were easy to adjust harnesses when I was struggling to adjust my childrens car seats. These are awesome! All the colours are lovely but I’d choose Aqua as it’s suitable for both boys and girls. The Aqua swirl is gorgeous! Of course my favourite feature is the fact that you can use a six point harness to an average eight years old height. Those extra years could mean the difference between life or death of God forbid something terrible happened! I’d definitely go with the gorgeous orange seat as it’s bright, unisex and just a great addition to the car. The Aqua Swirl is stylish and according to my son it is very cool. Love it! Aqua swirl would be my pick. The best feature is the adaptability through the child’s development. Black – Love the length of time it can be used from 6months of age through to 8 years old. Instead of having to buy another like we are in the process of doing right now. Any colour would be great, except for pink which my three boys say they hate! How fabulous to finally find a car seat that’s grows with your child, is compact and securely sweet! Grey would be my choice. The fact it lasts until the child is 8 years old makes it a great investment for their safety. I love the 6 point harness feature. Extra safety is what every parent is looking for. Pink! i love the vibrant colours and that it’s a seat that lasts to 8 with twist resistant straps. especially with a baby who hates getting the seat belt put on. Orange swirl is awesome, we have a very tall two year old boy with a long torso, I want him in a 5 point harness for as long as we possibly can, the Evolve would be perfect for him and keep him nice and safe and then can be handed down to our other boy who is 10 weeks old. Purple swirl, love all the easy adjusting features, I always have to ask my sister-in-law to help adjust the straps when the kids grow, can never do it lol! I’d love the ebony swirl, love the twist resistant straps! Pink Swirl. I love that the seat can be adjusted without being taken out, this would save so much time and effort! sung as a bug in a rug and protected. Aqua Swirl is my favourite colour. The twist-resistant straps is my favourite feature as twisted straps have caused me many headaches! Orange swirl, and I love the 6 point harness so my little girl (even when she’s not so little) can’t wiggle out of it! I have a Wiggly obsessed 2.5 year old who would love anything to do with the Wiggles. I would love one of these car seats (in aqua) for that Wiggly obsessed little man. I love that the inserts are easily removed for cleaning and that I wouldn’t have to take it apart to adjust the straps! I love the Aqua Swirl and particularly the safety and comfort aspects plus the fact that you don’t need a degree in Car Seats for adjustments. Versatility is also a big thing, especially if you only have 1 child. Orange for me. The cushioning looks comfortable. For me, the Aqua Swirl color is very lovely. Cushioning looks very comfy indeed! Aqua Swirl – so bright and cheerful. Best feature is the ability to use it up to 8 years – great value indeed! Ebony swirl would be awesome! Twist and Lift system sounds great and easy to use. I love all the colours but Aqua stands out the most to me! The best feature is the six point harness I think that’s awesome you get to use it up until 8 years old! Purple swirl. One seat to take you up to 8 years is brilliant. Too many seats end up as landfill. Ruining the planet to protect the next generation seems like a poor plan. Purple Swirl. I love that it is adjustable for a wide age range. That not only saves money, but it saves resources and the planet! Pink. I love that the one seat can stay with my precious cargo from baby to 8 years old. It’s a great investment that lasts for so long. I’d give that a whirl! Makes life with growing kids EASY! Aqua swirl. I love that this is all you need after the capsule! I would like the Ebony Swirl. I like the ebony swirl and the reclining system is definitely the feature I like best. It’s the only one I know of where you can easily change the reclining position even when the car is moving. I know my daughter would love the Pink Swirl!! I love the idea of still having the 6 point harness when they are a bit older, much prefer this to using the car seat belt. Aqua swirl love the easy adjustments and the twist resistant straps. There is nothing more frustrating than trying to untwist a strap! Orange swirl, best features are the adjustable height harness buckle & twist resistant straps. Aqua Swirl, love the Twist and Lift adjustment. I hate having to spend ages when in a rush adjusting the seat straps just because it’s cold and bubba is wearing more layers that day! Grey swirl. Safety first as well as making it a lot easier for adjustments without taking so long to make them. Aqua Swirl. I love that you can adjust height and remove the covers easily, without removing the whole seat. Ours get so dirty! Blue. It just looks so comfortable and supportive and safe!! It also looks a lot easier to adjust than our current seat. I can see my favorite design ‘Ebony’, too perfect on the evole caprice..
Not to forget my favorite efficient safety features ‘Twist & Lift’, plush padding for cuddling mini wiggles in the backseat. but grey, my fave, is practical! her bottle has me sold! Aqua swirl is a great unisex colour, which is ideal for me with both a boy and a girl. I adore the easy removable covers. My current car seats have to be removed from the car for cleaning making them such a chore to clean. Its so convenient to be able to leave the seat in the car and just remove the covers as car seats constantly get covered in crumbs from snacks. My favourite colour is the Aqua Swirl but they all look fantastic. What a great idea to have easy removable covers, so much easier to clean up messes. Aqua swirl and my favourite feature is the easily adjustable harness. Too many kids are sitting in seats with the wrong size harness because people find it too hard to change. There are no excuses with these seats! Aqua swirl. I love that it lasts up until 8yo and the easy adjust headrest! Ebony Swirl. The 6 point harness is a lifesaver when you have multiple car seats installed and cannot reach between the seats! Orange swirl is my pop of colour choice. Dual Layer A.C.T. headrest for added safety, means I can relax knowing my child is completely covered. They just need inbuilt earplugs to save my child from my car singing! Grey swirl, definitely the front head rest/height adjustment, no more difficult rethreading of straps!! Gray swirl. This would be the best seat for my small girl as I want to use her current seat for her impending brother, but she’s too small for a booster. Love the inbuilt, easy adjust harness. The grey swirl looks comfortable! I like how the Twist & list system makes it easy to adjust headrest and harness without having to uninstall. A step forward for children car seat! Aqua Swirl. What a great idea! I have a large 6 year old and we have been unable to get a good quality seat which fits him comfortably. This would be ideal. Love the Purple Swirl colour…. Two favourite features, firstly the ‘Twist & Lift’ system that allows one handed adjustments, just what a multitasking mum needs when her hands are already full…. And the ‘Type G Child Restraint’ which for your child/children is a bonus, as Safety is most important thing, and as they are Houdini’s at getting out of the seats, this feature has it’s bonuses!….. The purple swirl is stunning! I love products that grow with the kids, it’s great for the environment and it saves money. Ebony Swirl. Love the easy adjustment as kids grow to damn fast and I am always having to remove the seats to adjust. I would have to go with pink or purple swirl as those are my daughter’s favourite colours! I LOVE that it has no twist straps and six point harness right through the age levels. I would love the Aqua swirl or purple swirl. I think the twist and lift system is a fantastic innovation and would be very useful. Wow, love the product. I love that it is available is so many colours. It’s so hard to choose, I say either the aqua or purple, however my son would love the red one. I love that it has the extra padding for small kids and my children are on the small side, I love the fact that you can have one seat until 8 years of age. I would definitely go with Aqua Swirl as it is bright and cheery. I love a car seat with a harness right through til 8 years old. The easy adjustment of the straps would also be a godsend, as would be the no twist straps! I would love the teal swirls. I also absolutely love the fact that this seat is harnessed until 8, my kids are super skinny and this gives me peace of mind. Our favourite feature of the Evolve would have to be that you can use it from the ages 6mths to 8 years, that’s double the time of most other seats, amazing! We love the Aqua colour too, very eye catching. My little girl would love to take a whirl in the pink or purple swirl. This feature packed carseat is so user friendly and safe with the one handed Twist & Lift, a 6 point harness and twist free straps to make getting your kids into the seat and keeping them there easier. I love the fact it lasts up to 8 years of age and that it’s so easy to adjust without having to pull the seat out! We’d choose the aqua swirl, such a bright happy colour. Love the idea of a really safe restraint that lasts so many years. I wouldn’t be forgiven if I didn’t choose the pink! Just like I wouldn’t forgive myself if I had an accident with a sash belt before the age of 8. The infa secure ensures she never knows there’s a different option before she doesn’t need a car seat. Thanks infa secure! The purple swirl is lovely. I love the one handed adjustment of the headrest and harness is brilliant. Being able use it until they are 8 is very economical too. We would love pink swirl.Love the fact you can recline the seat when bub is in the seat. Also great you can adjust the headrest and straps without having to take the seat out of the car…The fact its one of the only boosters that keep your child in a 5 point harness until 8, which makes it the safest booster for the middle seat..
Purple swirl – great colour and overall the product is really safe! Twist resistant – oh yes please! Twist resistant straps!! A miracle!! 😀 We would love an aqua one! How good is it that you can remove the cover for washing without taking out the entire car seat? Love that feature. Grey swirl looks nice. ebony swirl,i love the fact it will take you right through to 8 years old no changing seats! I love the Aqua swirl design and that the restraint can be used until the child is 8. Having the option to do so not only makes the seat even more affordable, but continues to ensure high safety standards! without taking the restraint out. What a wonderful design and great ideas incorporated into one seat. Pick me!!!!! Just luuuurrrve the Aqua Swirl. And did you say one handed adjustment!!!!! But how does it go fitting in the back with 2 other seats? Ebony Swirl… Having one of these fantastic Car seats I would know my darling little grandson was safe and secure in his InfaSecure car seat till his 8th birthday. Purple swirl for my little princess. I love that it goes from 6 months through to 8 years. There is not much I dont love about these seats actually. Purple swirl. And being a safety engineer and a mum of 2. The safety aspects are the best features for me. Anything to keep those precious ones safe. I love the aqua swirl. And I love the six point harness right up til 8…awesome and twist free straps…yay! I’d choose purple swirl, and just love everything about this car seat! But especially love how no upgrades are required as it takes you up to 8 years of age! L_ittle ones deserve the best protection. Purple! and how easy it is to install plus twist-resistant straps so handy! Grey Swirl – the fact that it lasts from 6 months to 8 years!!! Aqua Swirl – Twist-resistant straps, 6 point harness till 8 years. Safety, comfort and cool colours…How awesome!! i love the fact its for 6 months to 8 yrs and the colour choices, no boring black this time! id chose the aqua swirl! its a nice colour and when i choose to have another baby its neutral enough for a girl too! I’d choose the Purple Swirl. I love all the great safety features, especially the six-point harness, also that the InfaSecure Evolve Caprice keeps fitting children as they grow and that adjusting is so absolutely easy. Ebony or grey swirl. I love the six-point harness since my 2 year old Houdini can get her hands out of her current car seat! Plus it will last me until she’s 8…brilliant! Grey or pink! Love the value in that it grows with your child! Aqua swirl. Love the one handed adjustment of the headrest and harness. Make it so much easier as I have grandchildren of different ages. So much easier to adjust for each one. All the features are excellent. I like the one-handed adjustment of the headrest and harness. Ebony Swirl is my favourite. The fact that it goes from 6 months to 8 years of age is fantastic – not having to buy a new seat at every stage. Grey would be the colour that I would choose. Orange Swirl is my choice. I love that the insert is fully removable for washing! I love the purple and that it lasts for so long. Great value. It’s the Louis Vuitton of car seats due to the fact it reduces crash energy to the child more than five times lower than the level required! Purple swirl please. the Ebony swirl is great for both girls and boys! I would love the grey swirl. I love that the seat is adjustable without taking it out of the car. I would love the grey swirl. I like everything about it particularly that it can reclined for a 6 month old but can be upright for the older child. This making it last longer.